Heidi Caswell Zander at the The Peter A. Torigian Community Life Center, in Peabody, MA. 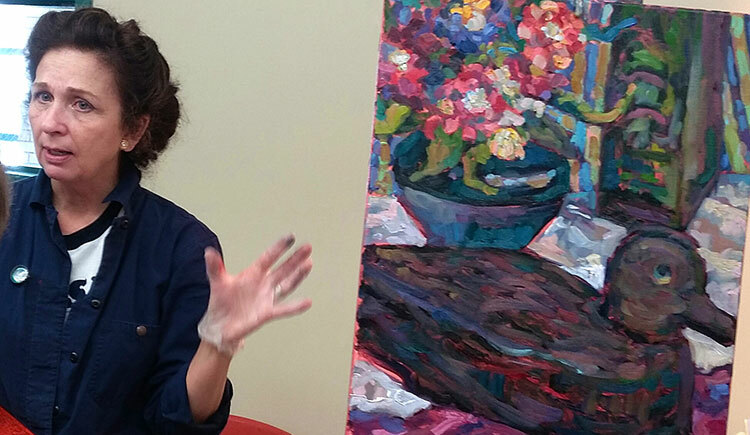 Heidi demonstrated her oil painting technique for members of the Peabody Art Association. 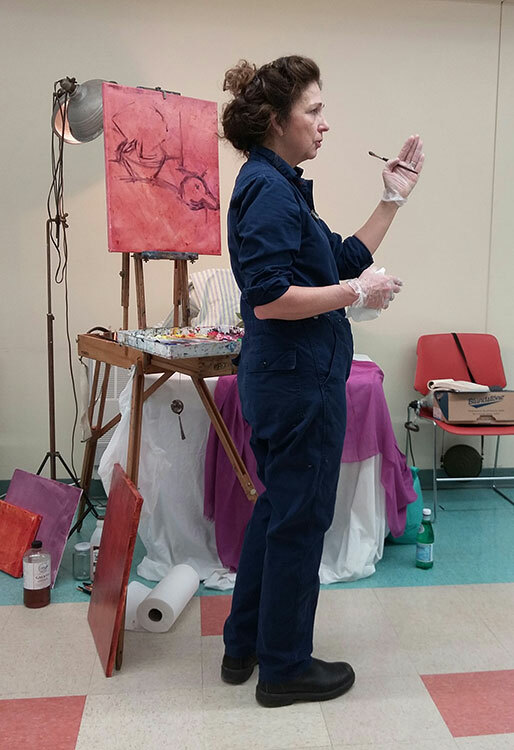 March 10, 2018, Heidi Caswell Zander, Vice President of the Rockport Art Association put on a terrific oil painting demonstration for members of the Peabody Art Association. 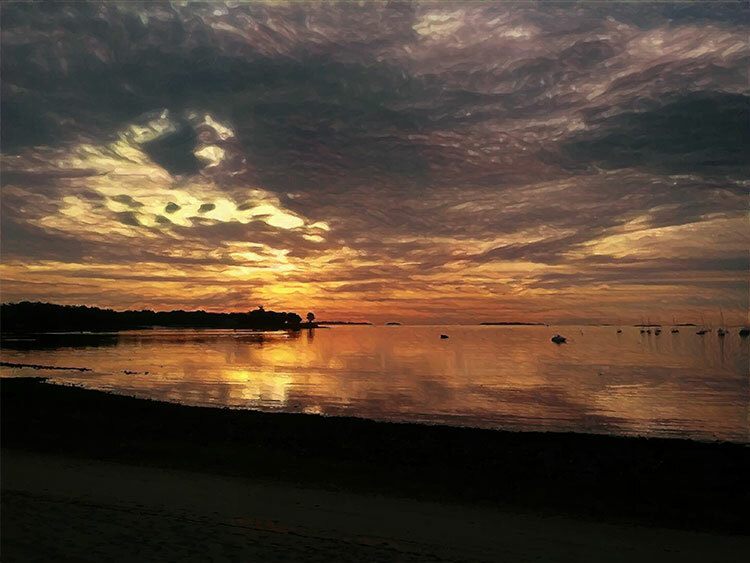 Heidi grew up on Cape Ann where she was surrounded by the thriving art culture located there. She began painting watercolors in her teens, and later attended the Rhode Island School of Design. Heidi is a member of the Rocky Neck Art Colony, and teaches adult workshops at her art gallery. 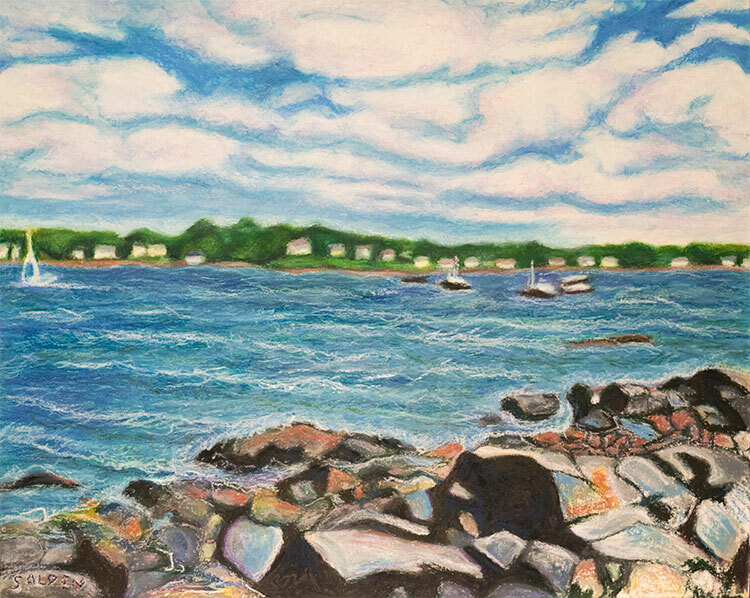 The Tidal Edge Gallery is located at 3 School Street, in Rockport, MA. Heidi told the group a story about an artist in Maine she studied with. This artist told Heidi, “artists are entertainers”. She believes this is true and encompasses many aspects of painting from composing the setting for a still life, to making interesting marks with paint on a surface. Heidi is inspired by the work of many artists including Matisse, Gauguin, Monet, and van Gogh. When painting with watercolors Heidi paints from light to dark. However, when working with oils, as she did today, she works from dark to light. Many dark oil paint colors are inherently thinner than lighter colors. But notably, when working in this manner the artist may add medium to insure the dark paint is thinner than the lighter colors. Heidi uses Gamblin Solvent-Free Gel instead of traditional mediums. Because she has found the paint she mixes it with will set up somewhat after 5 minutes. This way the underlying paint is easier to paint over. Heidi paints on canvases she previously tinted with color, and has allowed to dry. When beginning a painting, she first sketches in a cartoon using dark thin paint. Before painting on canvases, Heidi treats them with Gamblin Galkyd. First she mixes it up in a jar with a little bit of colored pigment. This creates a transparent color. Then she uses a roller to roll the tinted mixture onto her canvases. She likes to tint the canvases with color because of the way the color causes her to react. Pink and orange make good background colors for paintings with sunshine and for still lifes with flowers. These colors will twinkle through the other hues applied to the canvas. 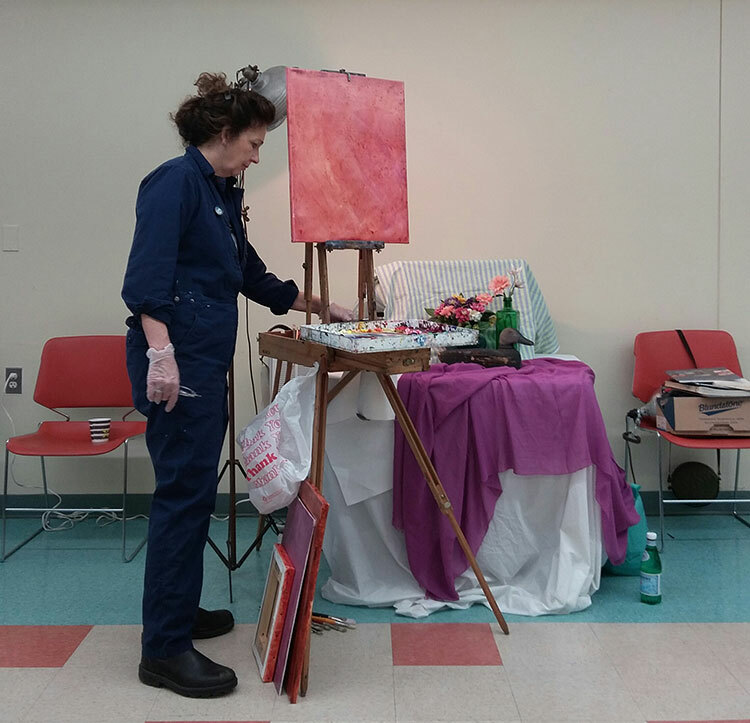 Heidi Caswell Zander sets up her palette carefully. Areas are reserved for lights and darks. She is careful not to let yellow mix with blue. Prior to painting, she loads her palette with numerous colors. 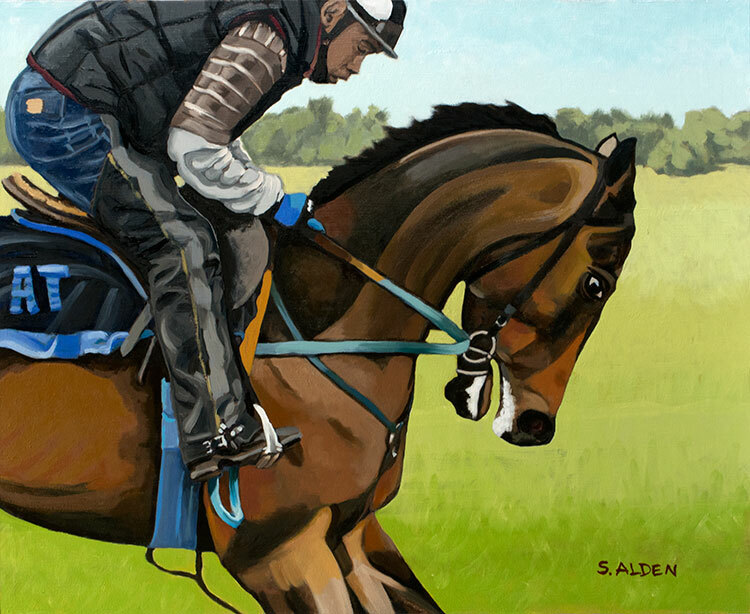 She likes to work quickly, and finds she can paint faster this way. She prefers to mix 2 or 3 colors together instead of using paint straight out of the tube. This will create colors that are more muted and natural looking. Also, she likes to paint warm over cool colors, and is careful not to let paint look like it was mixed with white. 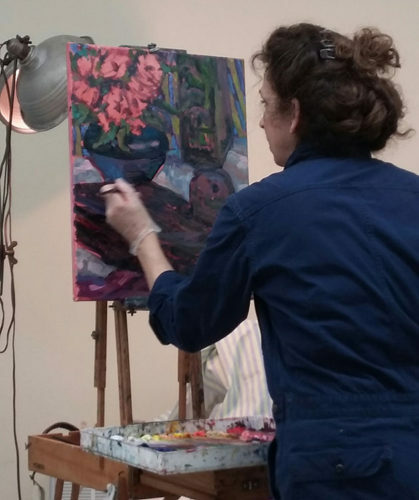 Heidi carefully composes still life scenes in order to get the best results from painting. Particularly important is the treatment of fabrics. An artist should avoid straight lines with fabric. The same goes for other things which one wants to have an organic appearance. She recommends using use soft loose lines for these elements. She starts her painting by outlining (cartooning) with transparent dark paint. As she works she thinks about the objects in the space. As well as the space around the object. Other things she considers are the relationships between the objects. For example which things are near each other. Also if elements are higher or lower, nearer or farther away from the viewer. Especially important are the angles of the lines. After the sketch is completed she fills in the darker areas. Noting color and values are critical as one begins to build up the layers of paint. Heidi and her demo painting of flowers, duck decoy, vase and fabric. Heidi warns to be careful not to go to light too soon or you can’t build up your colors as nicely. One should work with thin paint in the beginning. Afterwards thicker paint, as one gets closer to finishing the painting. Heidi Caswell Zander likes to start out with a couple of values darker, so she can go lighter on top later. She does not use black. Instead she prefers to use the darkest red, green, blue of whatever color she is using. Another tip is to use opposite (complimentary) colors to make greys. It is important to note that different colors next to each other will effect each one another. To make your painting pop, she suggests going back into some areas of your painting with complimentary colors. By working dark to light she rarely needs to clean her brushes. Additionally, she prefers to work from one color to another. For example her colors may transition from brown, to Thalo Green, Cobalt Blue, Carribean Blue, Green, light green, Ochre, and then to Dark Cadmium Yellow. Each step goes to warmer and lighter colors. Heidi strives to create unity in the her paintings. To view more Blog posts, visit the Blog Archive page.